Trisha and the Dung Beetle! Wishing you a wonderful day and year ahead. Now you might be wondering how are you linked to the Dung Beetle? It’s not a messy and smelly but quite an eco – friendly beetle. And, you are linked to it through the little special story I’ll tell you about it. You would be familiar with a beetle surely, living in the tropical climate of India you would have come across a tiny little bug scampering around somewhere. Hope you haven’t squashed one ever, they are quite cute and helpful creatures. According to the National Geographic, the scarab beetles make only about 30, 000 species of the total beetles in the world, which is about 10% of the total beetles…Only 30, 000! That’s a lot to me, what do you think? Do we even know 3 of them? Maybe you could ask your mother to help you find some near your house. 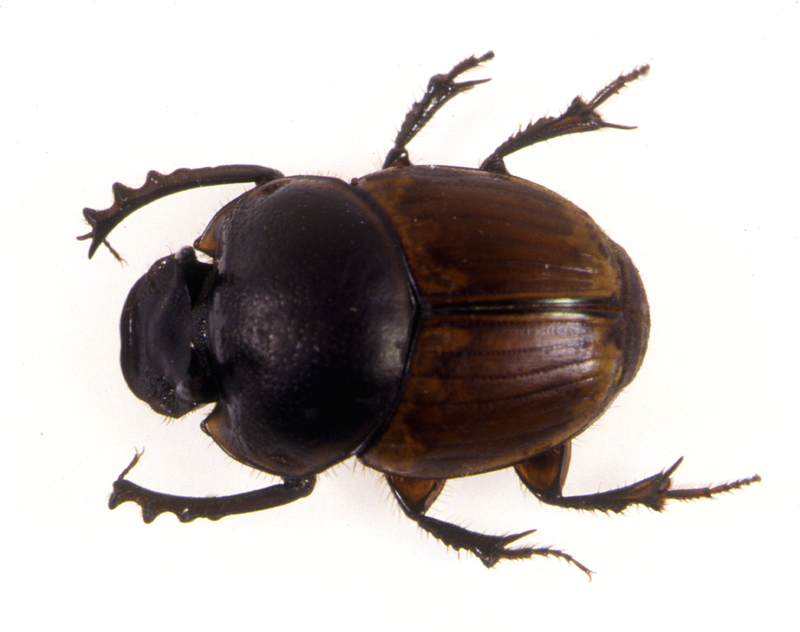 The Dung Bettle has a fancy name too, it is called the Onthophagus gazella…not easy for us to remember though. 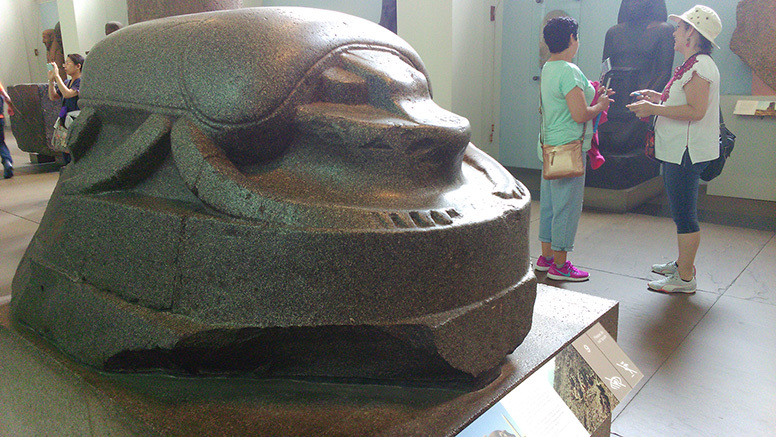 The Dung Bettle caught my fancy when I saw a large stone one at the British Museum last year. It is displayed in the Egyptian Gallery of the Museum. It is made of quartz, and not many stone sculptures of that period were made from this stone as it was not easy to find this stone. But we don’t really know why this stone was used, and since it was not easily found it was brought from a long distance to be carved into this big stone sculpture. And, quartz is a hard stone not easy to carve into a sculpture. You might wonder, like I did, why would there be such a large Dung Bettle carved out of a difficult-to-find and not-easy-to-carve stone in ancient Egypt? It is not one of the most beautiful bugs found on Earth and neither does it have a nice name! It is only when I tried to find about the sculpture I came to know that the Egyptians worshipped the Dung Beetle or the Scarab as they thought it represented Khepri, the form assumed by their Sun God at dawn. They believed that the Sun God Ra would disappear every night, get more powers and be reborn every morning at Dawn. And, they found this similar to the Dung Bettle which they found would disappear into the dung and appear just like the Sun God did. The scientific explanation is that the Dung Beetles lay their eggs in the dung and the young ones hatch from the dung – this fascinated the Egyptians. They also admired the way these Beetles would roll the dung into perfect spheres and carry them large distance pushing the dung ball backwards – now that is really unusual, would you know anyone who would take so much effort to carry home their food? The Egyptians depicted Khepri as a God in a human form with a Scarab as its head, just see the image and you will understand. Isn’t it very unusual and interesting? Do you know of any Indian God that has a human form and an animal or insect head? 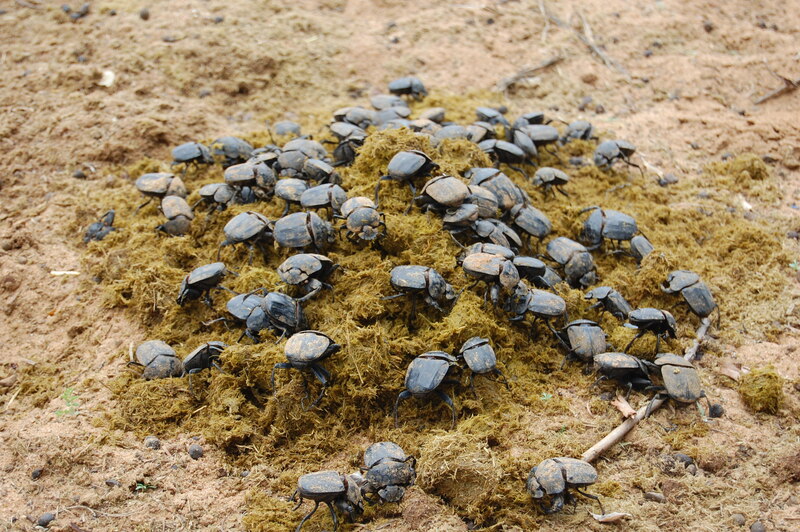 Have you ever had a chance to carefully look at the Dung Beetles? Or any beetle or insect? Imagine how curious the Egyptians must have been to understand Nature around them, after all they didn’t have the Internet to have answers to most of their questions. What has made you the most curious about Nature Trisha? Were you able to find your answers? I would love to know what they were, please share with me when you have time. If you look at the original photo of a Dung Beetle you will realise that the sculpture resembles it quite well – what do you think? While reading up for your blog post I also came to know that since these beetles are not found in Australia but are so important to eating up the poop of cattle and helpful in saving the environment they are actually being imported into Australia now! So much importance to a tiny insect that lives in poop! That makes us realise how important the tiniest of creatures on Earth are, and makes us respect them even more. Thanks Shuchi 🙂 it was meant for a child and the child was happy – nothing more fulfiling. Glad you liked it too!